Cory had new student orientation and registration for college today. College! What happened to my little boy? He's all grown up. 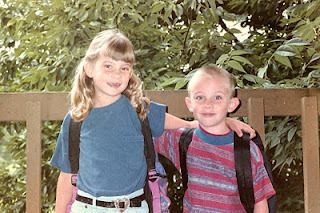 It seems just yesterday I sent him off to kindergarten. Well, actually walked him to school for his first day of kindergarten. We got there with time to spare, so I figured I'd wait with him by the door until it was time to go in. Cory had other ideas. As soon as he saw his teacher (we'd already met her at an Open House a few days earlier) he said 'you can go now, Mom' and hurried over to line up by her. Nope, he didn't need me anymore, he had school! And now he's registered for college classes. Somewhere along the line he grew up. I must've blinked or something. Oh my gosh - that picture is so wonderful! So cute!